This is the first game in the Streets of Rage series. 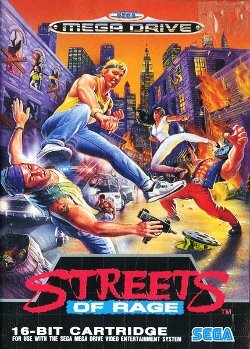 For other games in the series see the Streets of Rage category. Streets of Rage (ベア・ナックル 怒りの鉄拳, Bea Nakkuru: Ikari no Tekken?, "Bare Knuckle: Furious Iron Fist") is a beat 'em up developed by Sega in 1991 for the Sega Genesis. It was later ported to other systems. It also appeared in arcades on Sega's Mega-Tech and Mega Play hardware; unlike most arcade systems, Mega-Tech charged players for time, not lives or credits. In 2013, the game was ported to the Nintendo 3DS and released exclusively in Japan; this version of the game can be saved at any time and the language can be switched between Japanese and English. The game features three playable characters who are vigilantes combatting the evil Mr. X, the main antagonist of the series who takes over a peaceful city. Each of these characters have different attributes and movesets (similar to Golden Axe), but all can use a special attack to summon back-up to take care of nearby enemies. Unlike Golden Axe, however, Streets of Rage also allows the use of several different weapons such as baseball bats, knives and even pepper spray. The game features several different enemies as well as a large boss at the end of every level (except for Stage 7), similar to several beat 'em ups released at the time. An unnamed city is under the control of a crime syndicate, run by the series' main villain Mr. X. With the local government and police force under his control, crime runs rampant and chaos ensues. Having had their request for a special unit to combat the trouble turned down by their corrupt superiors, three young police officers (Axel Stone, Blaze Fielding and Adam Hunter) resign from the police force and fight the syndicate on their own.